This might be a bit spoiler-y if you haven't read "Rescue at Waverly", but towards the end of that novel, you learn that maybe the protagonist (Thad Marcell) isn't much of a good guy after all. He's done some evil things, and in one key chapter he's confronted with all kinds of destruction he's committed in his quest to find home. (Now some of those accusations were baseless or greatly overblown, to be clear, but others had a lot of truth to them.) One accusation came from expatriates of a world called Ailon, which lost a war and became enslaved because of a very selfish pirate raid Thad once conducted. I thought that one would be a great subject for a sequel, and devised a main plot along with a series of flashbacks that would contrast who Thad used to be with who he's changing into. Although there are some returning characters from the previous story who continue to develop in new ways, this one sees several new one-offs. You'll see them in "Rebellion at Ailon" but they aren't likely to ever appear again. To develop them, I did quite a variety of reading. Sun Tzu, Napoleon, Clausewitz, articles on guerrilla warfare, Revolutionary War spy rings, I even read some US Army field manuals! But most of all, after learning some of the "right" ways to conduct a war, I realized I actually needed very naive, inexperienced characters who know little about war, because that makes Thad–an experienced mercenary–that more valuable to them. And so much of the military history I studied became a guideline of what not to do when writing up the new Ailonian protagonists. Finally, there were a couple characters I had to develop in very specific ways just to make the story's climax that much more emotional. This series is more than just pulp science fiction to me. Even though it's got starships and lasers and hyperspace, ultimately it's about flawed characters who have both good and bad sides. Sometimes you love and sympathize with them, and sometimes you completely despise them, and that adds quite an emotional aspect to the story. 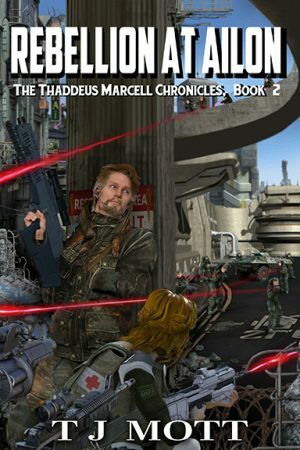 And so there's a flashback subplot that covers Thad's terrible and bloody pirate raid on an Ailonian convoy, and I'm hoping that the way that storyline weaves in with the main plot will powerfully tug at the reader's heart and maybe even shock them! Here's an excerpt from "Rebellion at Ailon." It's important to note that Thad Marcell is operating under an alias, Chad Messier, because he's actually a wanted person on Ailon and doesn't dare to reveal who he is. In this scene, he's been volunteering with a medical clinic on Ailon, which ends up acting as first responders to a fire at a slave-operated factory. But he has to take charge because they really don't know what they're doing, and also gets a glimpse at just how mistreated the enslaved Ailonians are. Thad took a radio and filter mask from Jason and equipped them after a quick check. Then he and ten other clinic workers jogged towards the refinery’s southern end as black smoke continued to steadily roll out of every opening in the building. A few squads of soldiers stood by the open doors of the loading docks, standing guard and watching with morbid interest as the clinic team climbed the concrete steps and entered the refinery. Even through the filter mask that covered his mouth and nose, Thad could still smell the terrible smoke from whatever was burning. It made his eyes sting, but he gritted his teeth and continued. They were in a loading/unloading area. Long rows of tall metal shelving stretched up towards the ceiling around them, holding a disorganized collection of crates, barrels, boxes, and pieces of machinery. The tops of the shelves were invisible, buried in the cloud of sooty smoke that hugged the ceiling. Breaks in the rows marked off aisles that led further into the refinery. And the refinery’s interior was terribly loud, filled by the mechanical sounds of pumps, fans, and other machines. Beneath it all, he could barely hear the sounds of a raging fire. Not a single soul was in sight. “What do we do?” someone asked over the radio. Thaddeus shook his head. The team had no idea what they were doing. They weren’t trained for this kind of situation. The others walked up behind him and several shrugged at each other. Thad waited for a moment, took a deep breath, and then broke out into a jog towards the gaps in the warehouse shelves. “Better him than us,” one of the other soldiers remarked. TJ Mott grew up on a small cattle farm near the booming metropolis of Westboro, Missouri (population ~140). He holds a bachelor's degree in Computer Science from Northwest Missouri State University and works as a software engineer in Omaha, Nebraska. He's always been a nerd with a strong interest in science fiction and has decided to try writing some of his own.